Abstract : China Economic Information Service (CEIS) of Xinhua News Agency, the government of Pu'er City and Yunnan International Coffee Exchange jointly released the Xinhua-Yunnan (Pu'er) Coffee Price Index in Beijing on Thursday. Photo: Release of the Xinhua-Yunnan (Pu'er) Coffee Price Index in Beijing on November 1. BEIJING, Nov. 2 (Xinhua) -- China Economic Information Service (CEIS) of Xinhua News Agency, the government of Pu'er City and Yunnan International Coffee Exchange jointly released the Xinhua-Yunnan (Pu'er) Coffee Price Index in Beijing on Thursday. 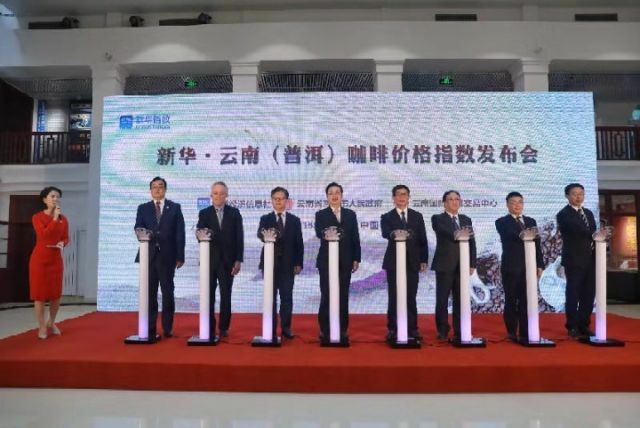 Compiled by the above three organizations together, the index aims to raise the brand influence as well as international visibility of the coffee produced in southwest China's Yunnan Province and provide the reference for government monitoring, scientific planting and trade decision. The index system covers Xinhua-Yunnan (Pu'er) Composite Price Index and Xinhua-Yunnan (Pu'er) Single-item Price Index. It samples raw coffee beans produced in five major coffee producing areas of Pu'er, Dehong, Baoshan, Lincang and Xishuangbanna of Yunnan. As China's largest coffee planting base, Yunnan needs an authoritative, influential and fair price index system to reflect trends in the coffee industry, and the release of the coffee price index will strongly promote the extension and upgrading of Yunnan's coffee industrial chain as well as the targeted poverty alleviation by means of the industry, said Zhang Guohua, vice governor of Yunnan Province. The release of the index will definitely play an important role in price and market guidance, pushing forward Yunnan's coffee industry development, increasing the incomes of the coffee growers and promoting orderly development of China's coffee market, noted Liu Zhengrong, vice president and secretary general of Xinhua News Agency. The data showed that the Xinhua-Yunnan (Pu'er) Composite Price Index has presented a downtrend since the base period (November 3, 2017). The index reported 812.69 points on October 12, 2018, down 3.59 points compared with the previous period and 187.31 points or 18.73 percent from the 1,000 points in the base period. It also showed that high-quality coffee beans had large premium space and strong resistance to fall in price. As compared with the base period, the secondary fine coffee beans witnessed a slight increase of 3.72 percent on October 12, while other varieties all witnessed a decrease of over 10 percent, indicating that cultivating high-quality coffee beans is the direction of the future industrial development.